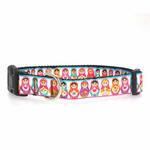 Ring in Oktoberfest with this Pretty Nesting Dolls Dog Collar! 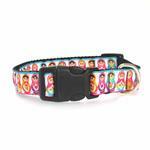 Dogs will love to add some cultural history to their day with the Pretty Nesting Dolls Dog Collar. 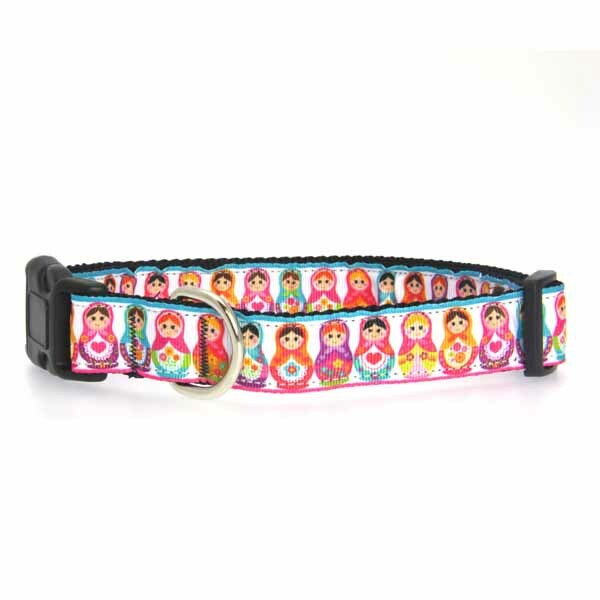 This fashionable, durable Ribbon on 1" Nylon Webbing Collars from Mirage Pet Products are sure to make your pooch the talk of the neighborhood! Made of durable nylon with a high quality ribbon overlay. Collars have high-quality adjustable quick-release buckles to fit a variety of neck sizes. Made in the U.S.A.
Posted On 05/15/18 by Korena S from King City, OR Yes, Korena S recommends this product! We love all of their great patterns. This one was no exception. Beautiful and well made!! This is such an unusual collar design! I really like it, but the colors are not as saturated as they appeared to be onscreen. BaxterBoo is the place to shop. Everything and anything you could imagine as far as pet accessaries, clothes, coats, tags, toys, leashes even jammies can be found at this site. I love shopping BaxterBoo and the quality of their merchandise is very good. Pricing of items along with shipping is a little high which limits me to shopping as much as I'd like. The customer service area is wonderful to deal with and shipping is very fast. I've been very satisfied with everything I've bought and my pets are always proud to wear their new coats. I would highly recommend shopping Baxter Boo to all my friends and family.